It was just the Pac-12 tournament start Stanford needed: The Cardinal (19-12, 9-9 Pac-12) clinched a 71-69 victory over a determined Washington team (16-15, 5-13 Pac-12) thanks to a 3-pointer by senior guard Chasson Randle with 2.4 seconds to go. These two teams headed into the game with somewhat similar trajectories. Both Stanford and Washington got off to strong starts that seemed certain to culminate in NCAA appearances, but troubles in the second half of their seasons left both teams out of the conference’s upper echelon. Wednesday’s first-round matchup was a hard-fought game that started with a hard-fought half. There were five ties alone in the first-half, the fifth coming after a pair of free throws from Randle in the last seconds before intermission sent the two teams into the locker room tied 32-32. Washington started the second half strong, opening up a seven point lead from some great shooting by Nigel Williams-Goss. However, two minutes later Stanford had already tied it back up at 51 a side. The last quarter of the game was a battle with neither side building anything more than a five-point lead. With 29 seconds left Washington’s Dan Kingman had a chance at the foul line to extend the team’s lead from one point to three, but failed to make his first on the one-and-one, allowing Stanford to grab the rebound. Kingman’s missed foul shot left Washington 0-3 from the foul line on the night and made Washington the only team in tournament history to not make a free throw in a game. Stanford went down the other way and was able to force two shots in the dying seconds. Junior forward Rosco Allen had a shot from the corner with eight seconds left, which clattered off the rim. Sophomore guard Marcus Allen climbed highest to pull down the board and dish out the ball to Randle, who hit his 3-pointer in the face of his defender to clinch the victory. 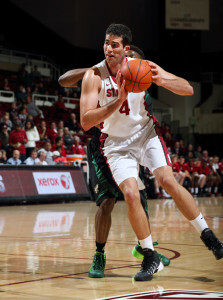 Fifth-year senior center Stefan Nastic led Stanford with 21 points and 5 rebounds. Despite his incredible last-second shot, Randle only managed 10 points on the night in an atypical performance. Next up for Stanford is Utah in the quarterfinals of the Pac-12 Tournament in what will undoubtedly be a well-contested matchup. Catch the game on Thursday, March 12 at 8:30pm PT on ESPN.